I’ve been trying to grow chamomile, but I’m container gardening which is always a crapshoot. Sometimes it works out, sometimes everything just… dies. 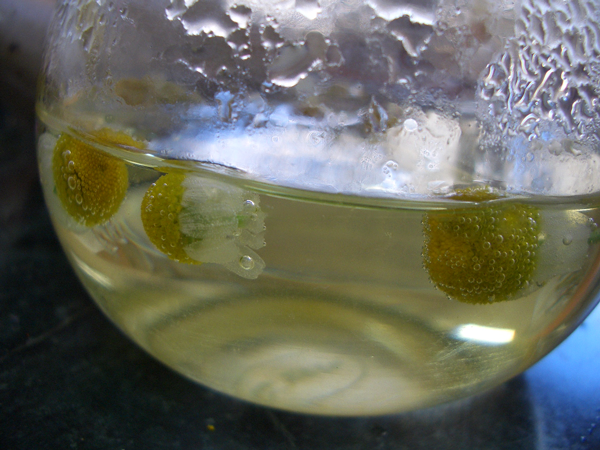 The verdict is still out on my chamomile, but one thing is for sure–it isn’t thriving. So I was very excited to see bunches of fresh herb at the farmers market. I wasn’t alone. The little bundles of gorgeous sweet-smelling flowers were gone in a heartbeat. 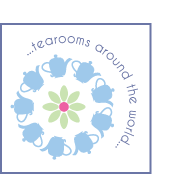 I went for a long walk after the market and found myself periodically pulling the chamomile out of the bag and taking a long sniff. I’m sure it was entertaining to those who were watching, but the aroma was heavenly. 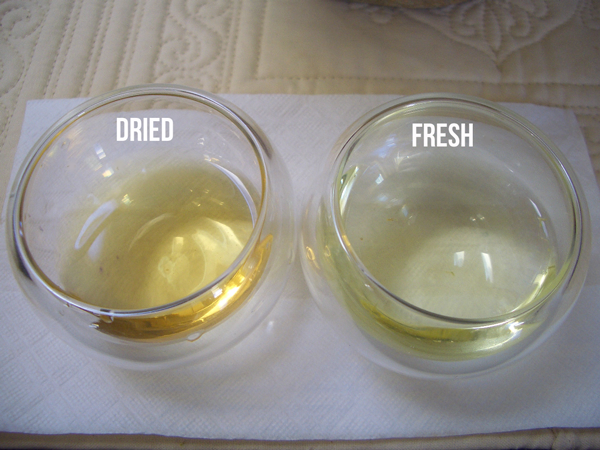 I’ve never made tea from fresh chamomile so I thought a side-by-side comparison with the dried herb would be interesting. What I found is the dried had a deeper yellow color and a melon/honey like flavor with a hint of bitterness at the end. The fresh never moved beyond a light greenish yellow, had the flavor of fresh apple with a little less bitterness. Preference? Fresh herb. The flavor was brighter. I’m reminded of tomatoes–canned make marvelous sauce, but there is nothing like biting into a fresh tomato in season. 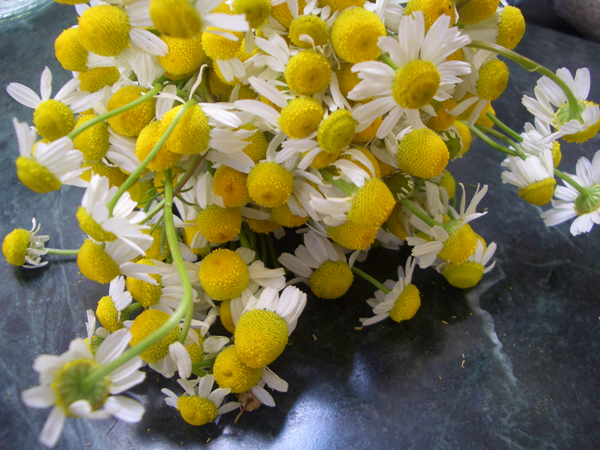 Oh… not everyone can get their hands on a bunch of fresh chamomile even in the depths of summer, but if you can, what a pretty treat to serve alongside a plate of cucumber sandwiches and little cakes. 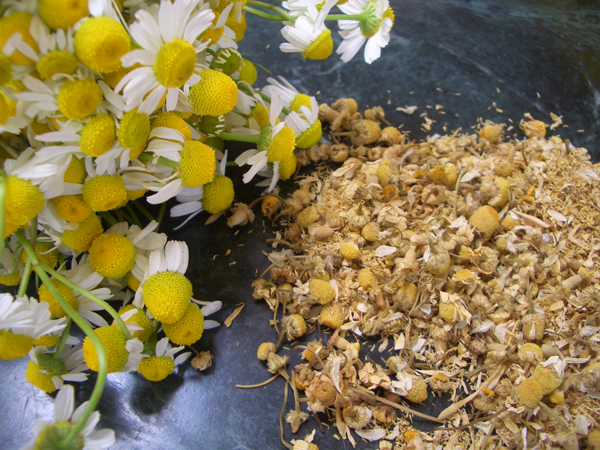 And chamomile is an herb known for its beneficial effects on the body. Its ability to calm the nerves makes it a great nighttime beverage.